This is the accessory section of our Meet & Greet Designers from Lakme Fashion Week Spring Summer 2011. Meet Hyderabad based accessory designer Suhani Pittie. A lot has been said about her exceptional artistic endeavors. Suhani is best known for creating fabulous pieces of jewelry from hardware materials such as steel, copper, brass, plastic and plated copper. Her collection for LFW SS 2011 “Urban Folk” is an impersonation of transitional landscapes of her hometown on jewelry. The styling is strong, funky and art nouveau. Suhani often refers her jewelry as “wearable art”. Inspiration for this collection – This collection is mostly a reflection of what’s going on in Hyderabad at the moment, in terms of the city undergoing a massive makeover where newness and globalization is taking place at all corners of the city. Accessory Trends for 2011 –Accessories should have a bit of everything in them be it bold color, a strong personality, a sense of humor or a vintage look – one should have fun with their jewelry and accessories, then the whole ensemble becomes interesting. Favorite Designers – I love the work of Stella McCartney. Future Plans – Our agenda for this year is to ramp up our already highly successful e-commerce business. You can find more of her work here. Psst:– Her sister is renowned fashion designer Anamika Khanna. No wonder, artistic style be it jewelry or fashion runs in this family for sure. While browsing through the lazy neighborhood of Lodhi Colony last weekend, I stumbled upon an uber cool store named “Play Clan” – a desi inspired retail outlet that carries merchandise produced by a small group of insanely talented designers who believe in putting the laugh-out-loud spin on everyday objects. This is “Indie Cool” at its best. Owned by India’s new design guru Himanshu Dongra, his work represents a mix of Indie pop art with a dash of humor based on everyday life in India. Their works of art depicted from street culture, deities & Bollywood icons extend into products that include fashion wear, stationary items, accessories and home goods. 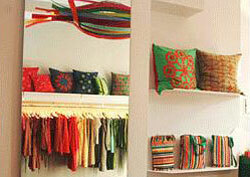 I caught up with Himanshu yesterday in his fabulous store in Lodhi Road and asked him how it all began. Here are some excerpts from our conversation. I come from a fashion background. Having studied fashion from NIFT, I always had a slant towards the illustrative and graphic stance to things. When and what motivated you to start Play Clan? I started Play Clan in 2008 with the idea of making great design more accessible and affordable. We started out with the simple idea of just having fun with art on everyday life themes in India. The response we received was well appreciated and one thing led to another; we got a couple of international awards such as ‘Elle Décor’ award for ‘Best New Talent in India’ which encouraged us to take this concept forward and extend the range and make more products. How are you involved in this venture? As the Founder of Play Clan, I have the task of sustaining the brand so to speak; my job is to come up with retail concepts, showcase our products, develop more collections and ensure the quality of our products. All of our products are well thought out with a certain level of detailing and a lot of conceptual placement of artwork and techniques. These items are made in India with pride. Where does the Play Clan team get its inspiration from? I think for us, “making the mundane magical” was what we intended to do when we started out and still continue to do so. We get our inspiration from everyday life in India and look for humor and small pleasures attached with them. How was Play Clan’s collaboration with Paul Smith? It was a real honor for us to be associated with the iconic brand. We thought there were similar synergies to his design processes and ours. We came up with this idea of presenting a "Tale of Two Cities", a project that showcases the relationship between Delhi and London through a series of Warli artworks featuring the two respective cityscapes and their iconic figures. We intend to open more stores all over the country. We are launching our new store in Pune within the next two months. We are looking forward to doing interesting things like opening a café someday. So if you want to get your funny bone tickled, do make a halt at Play Clan. Even their online store has a funny tagline - its says 'from our store to your door' . LOL!!! 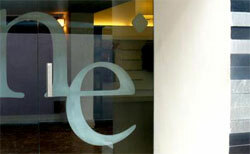 These days I frequent the DLF Emporio mall quite often. Yes, I admit the clothes and jewelry are an attraction but more so, the stores by itself are the actual appeal. 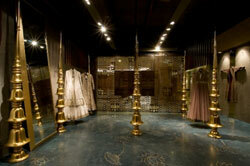 An amazing boutique at the Emporio Mall is of ace designer – Rajesh Pratap Singh. Known as the “scissor store” and you’ll know why shortly, this store has drawn attention of major architects and design houses worldwide. Known for his immaculate tailoring, sophisticated clean lines and restricted color palettes he is a designer par excellence. 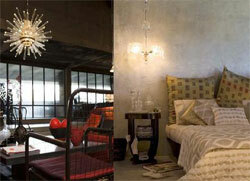 Keeping his theme of clean contemporary looks, his boutique is unquestionably a reflection of his minimalistic style. His cage like store is entirely made of scissor lace work as in scissor walls, scissor doors and scissor hangers. Still don’t believe me!! Look closer and you’ll see it’s actually a pattern of lace work using scissors (the tailors’ tool has been smartly used as a metaphor). The “scissor” was laid into motifs and patterns to generate a lace like surface. My favorite aspect of the store is how the architect has cleverly integrated details such as hooks and shelves into metal scissor lacework. Very Impressive!! 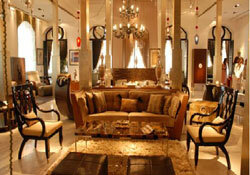 Don’t miss to check out this space when you are in town. We are already in the second week of the New Year and exciting things are happening on our front. Speaking of excitement, I’m heading home to India this week for a mini vacation and while I’m there, I’m hoping to make it a worthwhile work trip. A girl does need to charge her batteries once in a while and get back to work. So stay tuned for brand new updates. We leave you with some fascinating desi flavored fashion images of Tarun Khiwal`s work. Love his stuff. It’s celebration time for Indians worldwide as the festival of good will, righteousness and light (Diwali) falls upon us. This Sunday marks the beginning of the 2009 festive season with the observance of Ganesh Chaturthi. Speaking of festivals and deities, we’d like to mention about Ghee Happy. Yes, a lot of design and animation blogs have already mentioned and praised about this whimsically funny site. But still we couldn’t miss this one. Ghee Happy is an amusing site started by Pixar animator and super funky desi designer Sanjay Patel who has introduced and popularized the Hindu Gods in a charmingly new way. In his widely acclaimed book, ‘The Little Book of Hindu Deities’, he has successfully depicted Hindu mythological gods in a fun and appealing manner to a younger audience. His illustrations are fresh, cutesy and delightful. You can’t help but smile when you see them! His designs will definitely make you glee, so go ahead and grab some here. Let the festivities begin!